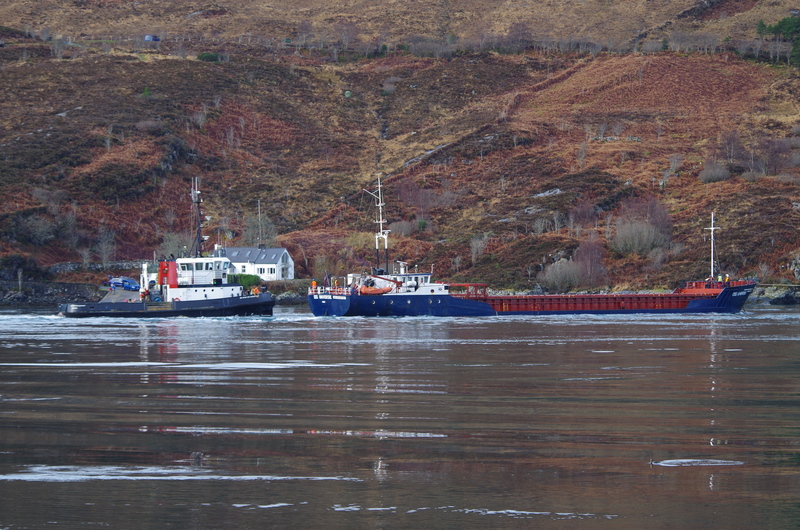 Fresh calls for an emergency tug to be stationed in the north-west were made this week after a cargo vessel lost its steering in the fast-flowing Kylerhea straits between Skye and the mainland. Local MP Ian Blackford has written to the UK Minister of State at the Department of Transport, Jo Johnson, calling for the immediate reinstatement of an emergency towing vessel in Stornoway to better respond to emergencies off the west coast. 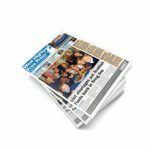 Mr Blackford said that having an emergency towing vessel, based within a short steaming time of the west coast, was “vital” . The ETV was removed from Stornoway in 2011 as part of a cost-cutting exercise by the UK Government, and in 2015 a petition calling for it to be reinstated fell on deaf ears. Scotland’s only ETV is currently based in Orkney. 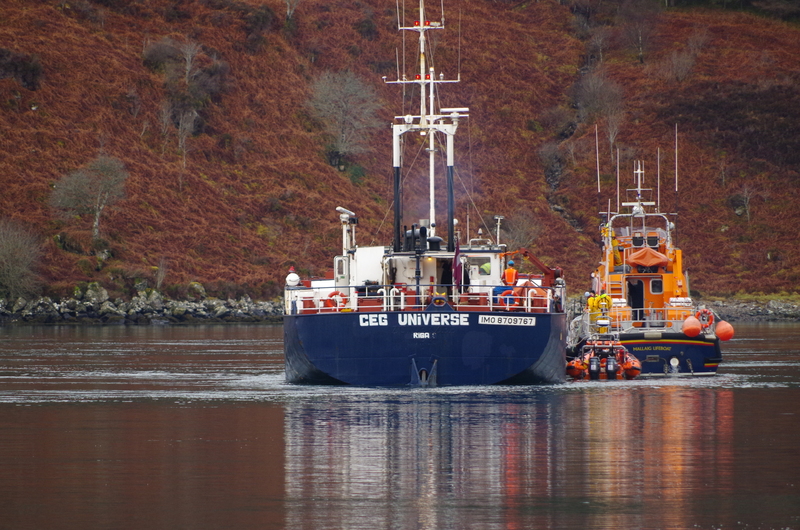 In Sunday’s incident in the Kylerhea narrows the 1,200-tonne cargo vessel ‘CEG Universe’ became disabled due to a broken rudder. The vessel was held in tow against the strong current through the concerted efforts of the Kyle and Mallaig lifeboats until a tug operated by the nearby Butec base was able to join them and provide the force to pull it to safety. In December last year, the Norwegian cargo vessel MV ‘Fame’ suffered an engine failure off Taransay in gale-force winds and eight-metre waves. RNLI lifeboats from Stornoway and Leverburgh, together with the Stornoway Coastguard helicopter, were on scene quickly. MV ‘Fame’ drifted clear of the rocks in the intervening period and a line was secured, allowing it to be taken under tow. On that occasion, the ETV did not arrive until the next day from its base in Orkney, having fought its way through challenging conditions to reach the stricken vessel. Mr Blackford said: “On two occasions disasters have been averted by lifeboat and other emergency services putting in a tremendous effort — and also by a good deal of luck, with one ship drifting away from the rocks and in this latest incident being close to Butec facilities who were able to provide a tug to pull the vessel to safety. Comhairle nan Eilean Siar leader Councillor Roddie Mackay also this week called on the UK Government to reinstate the west-coast-based tug after the Kylerhea incident on Sunday morning. 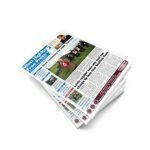 Cllr Mackay said: “At the weekend we had another incident off the west coast which could have seriously impacted marine wildlife and the coastal environment. These incidents are all too frequent and we remain very concerned, as do colleagues in neighbouring councils, about the current situation which increases the risks for mariners and the environment.